NEW RECIPE: Lean white ground turkey with just a few simple ingredients make these soft and tasty meatballs – ready in less than 30 min. for your favorite sauce or to freeze. Lean chicken breast and lots of veggies with a quick & simple marinade make a fun and healthy meal you can bake in the oven. Start to finish: 45 minutes. This quick and easy, light, healthy dinner has lots of vegetables, lean chicken, and it all cooks in one pan. Start-to-finish: 35 minutes. 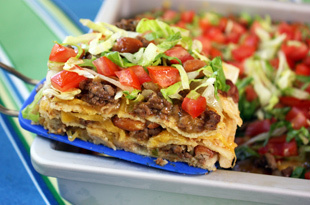 With soft corn tortillas, lean beef, pinto beans, and cheese, this easy casserole will quickly become a family favorite. And it’s gluten-free. Here’s another “everything cooks in one pot” easy meal. 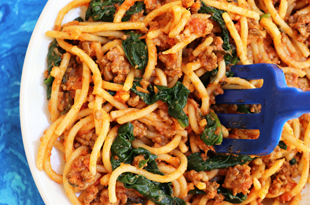 The spaghetti cooks right in the sauce with spinach tossed in at the end for a fast 30-minute meal. 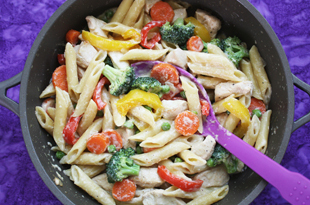 There are more vegetables than pasta in this creamy chicken dish and it all cooks in one pot… start-to-finish including prep: 30 minutes. 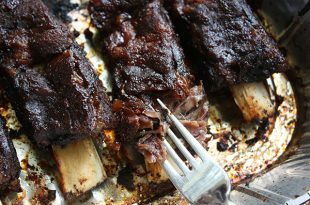 Just like my pork ribs, these beef ribs fall off the bone too. 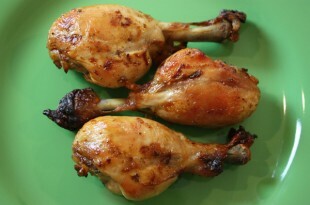 Make them entirely in the oven or finish them on the grill. 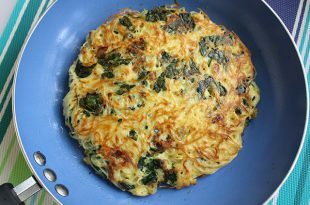 Quick and easy vegetarian meal using angel hair pasta, eggs, baby spinach, and parmesan cheese. 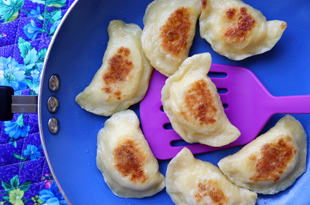 Cooks on the stove top – ready in 30 minutes. Imagine tender meat you can cut with a spoon and potatoes full of flavor… it’s one of the ultimate comfort foods. 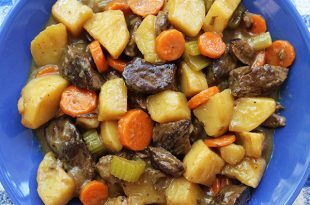 This beef stew takes time but it’s easy to make. 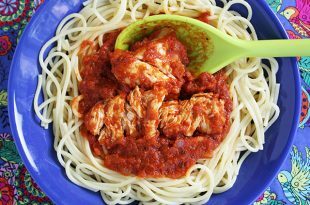 Lean chicken breast cooked in spaghetti sauce becomes super soft and tender in this easy, low-cal recipe. 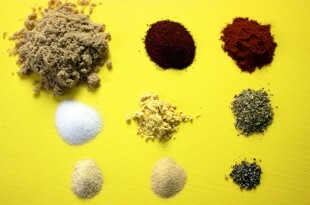 Making your own homemade dry rub is easy and takes five minutes. 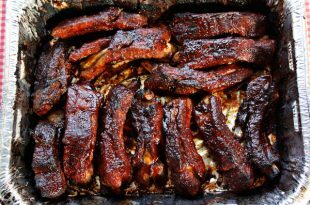 It’s what I use on my baby back ribs that everyone is making… and loving! Recipes don’t get much easier than this. 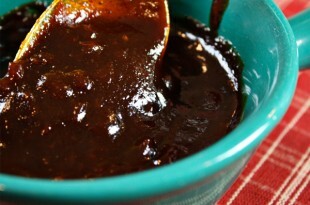 This is my own creation for a sweet and sticky barbeque sauce. I’ve never found a bottled sauce this good! They call it Blasted Chicken because you roast it at very high heat for a short time and the result is foolproof – tender and moist chicken every time. It’s the healthiest (and easiest) meal I make. 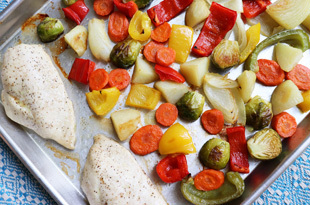 Lean, skinless chicken breast with healthy roasted veggetables all baked on the same pan. Start to finish: 45 minutes. Lots of fresh tomatoes, whole wheat tortillas, pinto beans, jalapeño pepper, and low fat cheese make a delicious vegetarian meal. 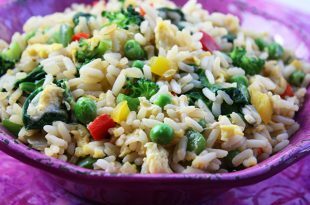 There are lots of healthy veggies (broccoli, spinach, peppers, peas) in this quick 20-minute vegetarian meal. 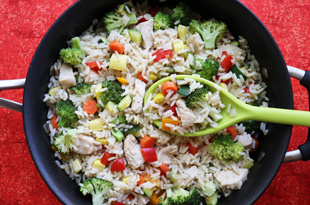 Add some leftover chicken for a great chicken fried rice. So simple. You’ll need only seven ingredients to make this easy casserole with lean ground beef, mushrooms, and cheddar cheese. It’s the perfect family dinner. 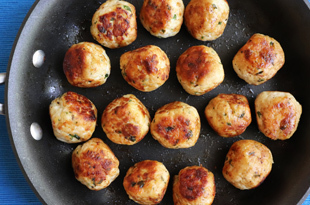 Ground chicken breast makes delicious meatballs with just a few simple ingredients. 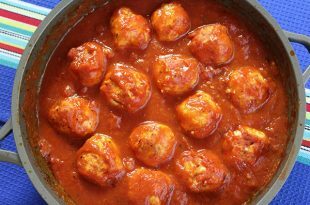 For the softest meatballs, cook them right in the sauce. 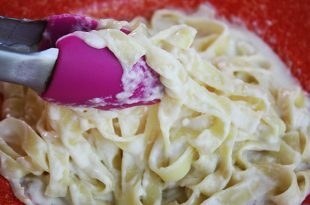 There is no heavy cream or butter in my smooth and rich-tasting Alfredo sauce. Start your pasta first because this easy recipe takes only five minutes. Foolproof, easy no-knead pan pizza with a golden crispy crust bakes in a cast iron skillet. It’s the best deep-dish pizza you will ever have! 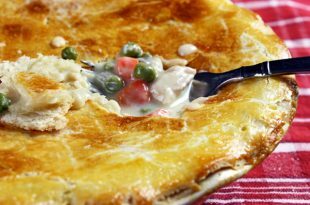 This easy, healthy chicken pot pie from scratch only takes one hour start-to-finish. Rich & creamy filling, flaky crust, and no cream or butter anywhere! I love this moist chicken with seasoned potato wedges because it all cooks on one pan with no fuss. 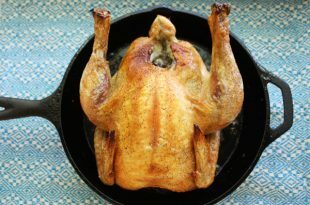 The chicken cooks on a broiler pan so the fat just rolls away. This quick & easy stir fry cooks in less than 10 minutes. With fresh orange juice and fragrant sesame oil, it smells and tastes amazing. It’s one of my top ten favorites. 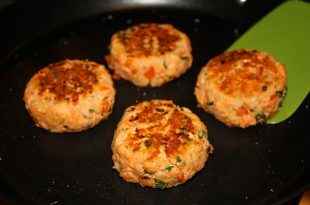 Canned salmon makes for a quick and healthy dinner when made into delicious patties with red pepper, parsley, onion, and fresh whole wheat bread crumbs. 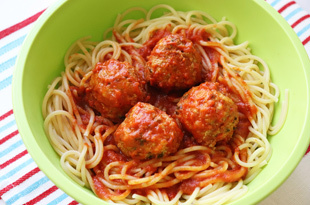 For the leanest, softest meatballs I use ground sirloin and cook them right in the sauce. 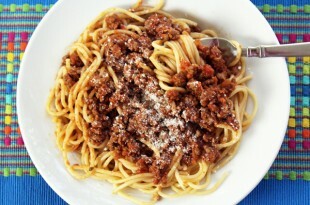 Make this family favorite Italian dinner, all from scratch, in about 1/2 an hour. Twenty minutes! Four ingredients! 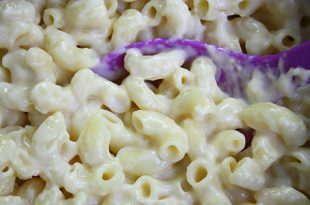 That’s all it takes to make this creamy, delicious, low-fat mac & cheese made with 1% milk and reduced fat cheddar. Yummm! 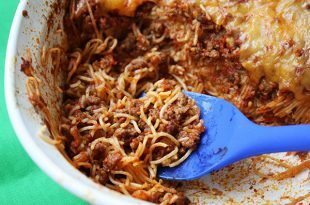 You’ll barely have time to cook some spaghetti and make a salad with this quick and easy meat sauce using lean ground beef and canned tomatoes. It’s a kid-pleaser! 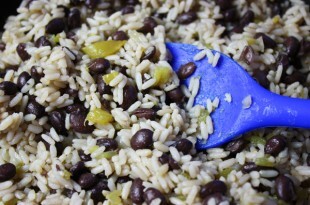 All you need is two cans and a box of rice, some onions and garlic, and you have a healthy dinner in less than 30 minutes – rice & beans with fire-roasted chiles. 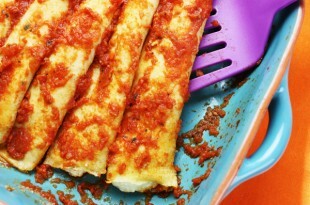 Tender melt-in-your-mouth manicotti are made with soft whole wheat crepes filled with three cheeses and topped with my quick & easy spaghetti sauce. Start your side dish first because these easy cutlets take less than 20 minutes to make. 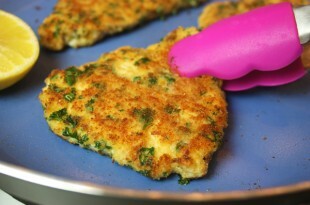 Lean breaded chicken breast with parsley & fresh zest is cooked in a bit of olive oil. 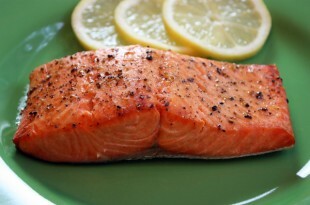 All you need is a lemon, some oil, and salt & pepper to make this delicious salmon – and there’s no cleanup! It’s the easiest, healthiest dinner you can make. This is the easiest and tastiest way I know to cook boneless, skinless chicken breasts. 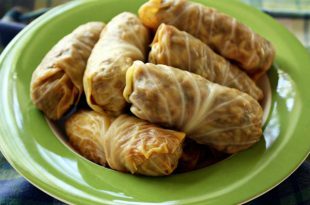 I baste them with a sauce of fresh lemon juice, olive oil, garlic & herbs. My low fat mac & cheese has four vegetables built in but it doesn’t have to be for grownups. 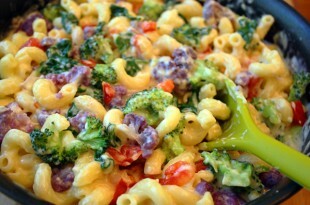 Call it rainbow mac & cheese for kids. Make it in 30 minutes! 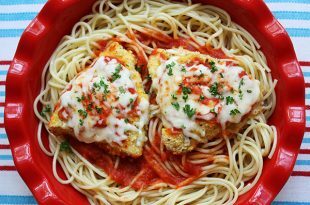 You don’t have to fry to get crispy and tender chicken parmesan. Oven baking keeps it light and low fat and my recipe means almost no cleanup. 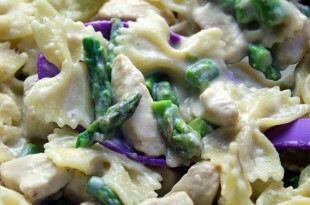 Rich and creamy but light and low fat, this is my version of alfredo sauce over lean chicken and healthy asparagus. 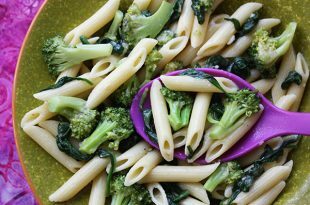 This easy dish also works with broccoli. 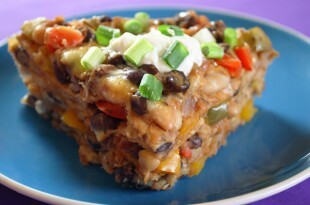 Whole wheat tortillas become soft as butter in this easy casserole loaded with 2 kinds of beans and multi-colored peppers. Customize it either spicy or mild. Want homemade pizza? Have it now! 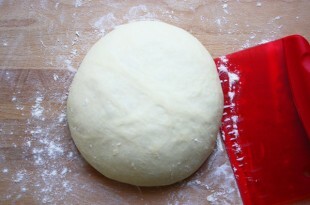 This quick and easy pizza dough, made from scratch, is ready to use in less than twenty minutes. 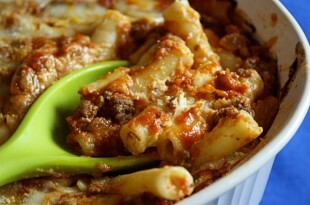 This easy casserole is my “lazy lasagne” made lean and healthy with ground sirloin and part skim cheeses. I promise you that everyone will ask for seconds. This easy family dinner all cooks in one pan for easy cleanup. 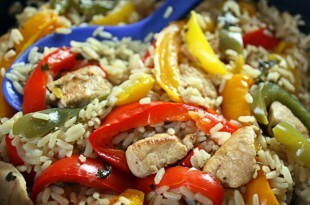 Lean chunks of chicken breast with antioxidant-rich multi-colored peppers – cooks in 30 minutes. 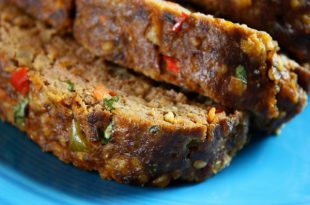 This may be the best meatloaf you’ve ever had and the healthiest, made with extra-lean beef and added vegetables – and baking on foil means no cleanup. 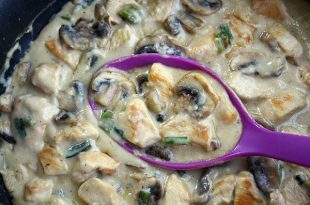 Lean chicken in creamy mushroom sauce cooks in 15 minutes and will disappear even faster. No butter – and probably no leftovers. Serve over rice or noodles. Make your pasta count! By adding superfoods like broccoli and spinach, your pasta is now full of anti-aging health benefits. Make it in 15 minutes. 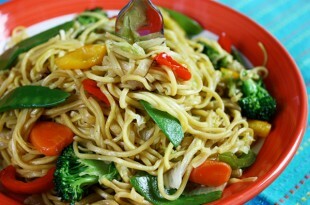 Eat your healthy veggies in this easy lo mein side dish and you may never order takeout again. Add leftover chicken, shrimp, or pork and it’s all you need for dinner. 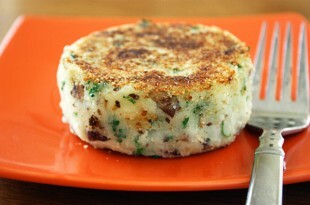 You’ll hardly notice the sardines in this potato patty flavored with green onions and parsley. 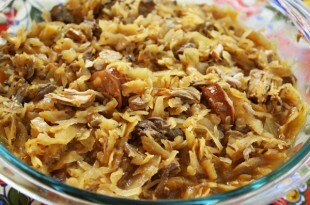 Sardines are “health food in a can” full of minerals and omega 3s. Start-to-finish: 45 minutes! 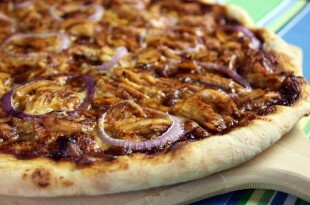 Sweet & spicy bbq sauce on a crispy pizza with shredded chicken & onions – Yum! 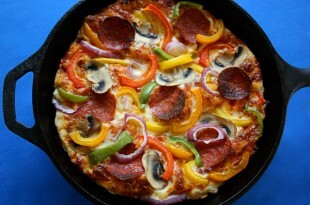 Make on a pizza stone or in a pan. 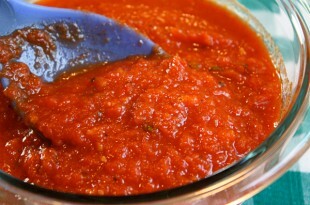 Only 5 ingredients to make a delicious sauce for your spaghetti & meatballs or chicken parm. Super easy with canned tomatoes. Cook for 15 minutes. Add basil. Done. 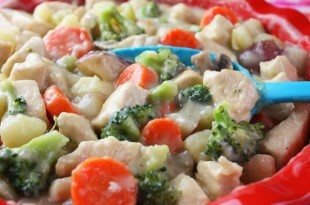 Lean chicken breast with lots of health-building vegetables in a thick, low-fat, creamy sauce made without butter. This one-pan meal is ready in 40 minutes. 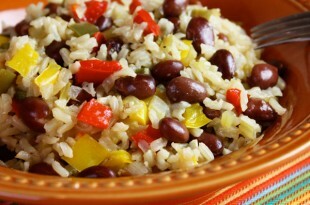 A simple, heart-healthy meal full of cholesterol-lowering fiber and antioxidant-rich peppers. Using canned beans make this an easy one-pan supper. 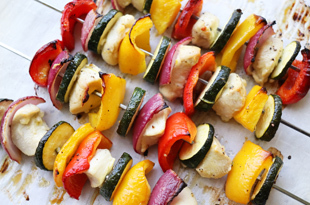 Need a super healthy, super easy dinner that’s ready in 30 minutes? 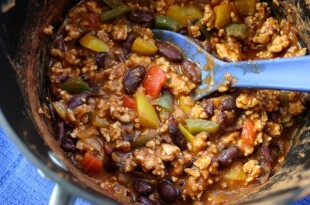 My turkey chili is low fat, high fiber, and full of antioxidants. Everything in the pot. Cook. Eat. 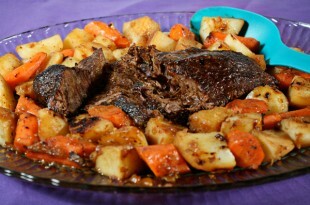 Classic pot roast will bring everyone to the table for a family Sunday supper. This easy recipe produces richly browned meat that’s fork-tender and perfect vegetables. 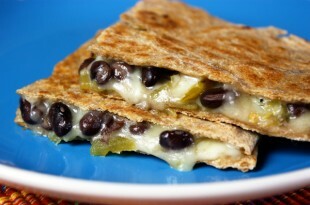 This healthy quesadilla takes just minutes to make, uses reduced fat cheese, calcium-rich black beans, and whole wheat tortillas. 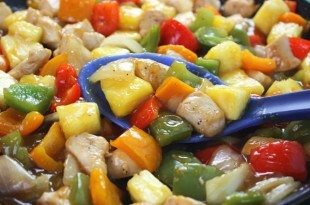 Fresh pineapple makes a huge difference in this quick & easy, healthy stir fry. Different colored peppers mean a bigger variety of anti-aging benefits. Cooks in 10 minutes. Make this healthy meal in 20 minutes. 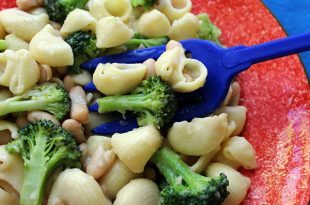 Vegetarians will like this meatless dinner recipe with cancer-fighting broccoli and cannellini beans for extra fiber and protein. If you like your pizza thin and crispy, this is the one to try. 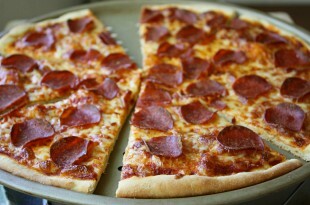 My healthier, low fat pizza has a crispy crust, and I’ll show you a trick for de-greasing the pepperoni. 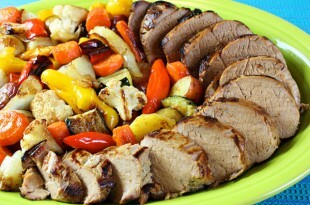 Lean & inexpensive pork loin is marinated in lemon, garlic, mustard, and honey, browned and oven-roasted along with a huge pile of healthy colorful vegetables. 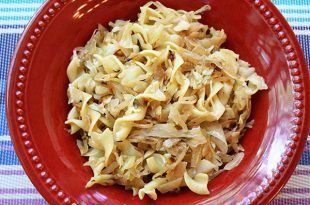 You’ll forget these are skinless after marinating them in olive oil, citrus juices, garlic & spices. 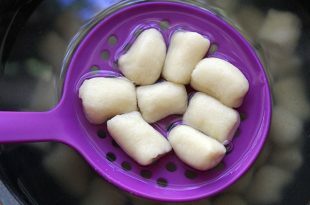 They’re oven roasted and make good weekend snacks, even cold. 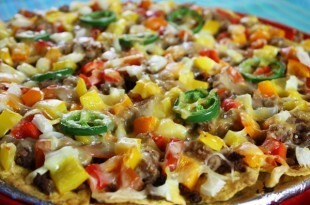 Nachos can be healthy… if you make them with the right ingredients. 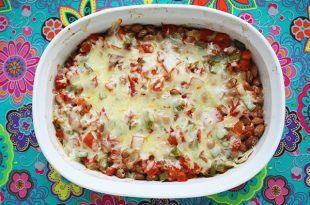 This healthy recipe uses reduced fat cheese, lot of veggies and beans, and seasoned ground sirloin. I should have just called this section “Comfort Foods” because almost everything seems to fit. Recipes like my homemade beef stew and meat loaf and pepperoni pizza are like a warm blanket on a cold night. There’s no question I like to cook but I still like to make things the simplest way possible and with the least amount of work. I figure if I can simplify something like my marinated pork loin recipe or my Bolognese sauce, then I’ll have more time to make dessert! 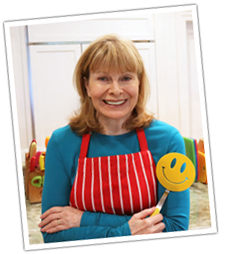 Many people seem to be short on time these days so I am always looking for simple recipes that will let you make 30-minute meals for your family. 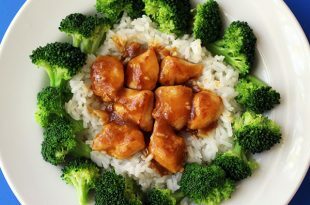 Try my orange-sesame chicken. It’s basically a stir-fry and everyone who tries it loves it. 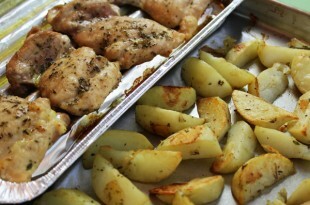 Healthy meals like my thighs & fries are really easy too and the best part is it all cooks on foil so there’s no cleanup!